The list of accepted papers can be seen here, and a tentative programme here . Conference: 17 – 21 December 2018. Pablo Shmerkin, Universidad Torcualto Di Tella, Argentica. 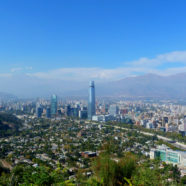 The conference will be hosted by the Departamento de Matemáticas at Universidad Andrés Bello, which is located in the República neighborhood (subway station “República”) in Santiago de Chile. If you are planning to attend the conference, please fill out the registration form here as soon as possible.